The Clooneys brought "Je Suis Charlie" buttons. Helen Mirren wore a pen pin. Jared Leto spoke in French. The recent terror attacks in and around Paris were repeatedly invoked on the red carpet and at the podium of the Golden Globes, the annual movies and television award celebration, held on Sunday in Los Angeles. A message about freedom of expression was met by a standing ovation early in the evening, and by a roar of applause again toward the end. 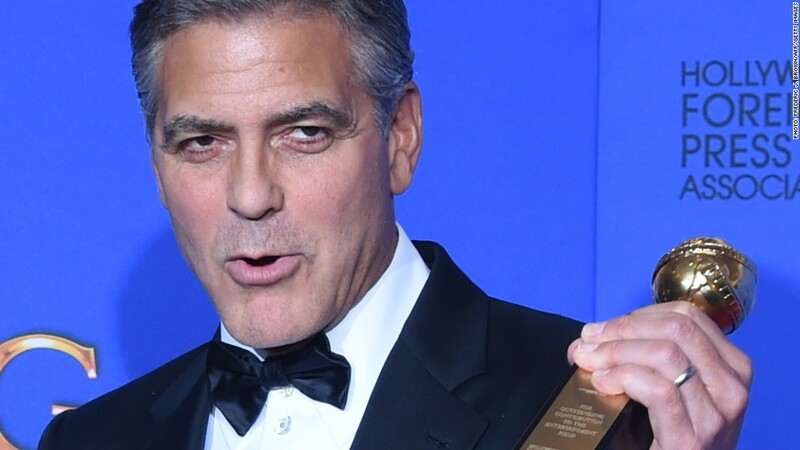 George Clooney, who was being honored with a lifetime achievement award, brought up the "extraordinary day" that had unfolded, with millions of people marching in Paris and other cities. The marchers "were Christians and Jews and Muslims," Clooney said. "They were leaders of countries all over the world." "They didn't march in protest," he said. "They marched in support of the idea that we will not walk in fear. We won't do it." Clooney ended his speech with the now-familiar saying, "Je Suis Charlie," or "I am Charlie" in English. Clooney and his wife Amal wore buttons with that slogan while walking the red carpet. Two professional photographers on the carpet set up "Je Suis Charlie" signs where they were working; several actors were photographed holding signs of solidarity. 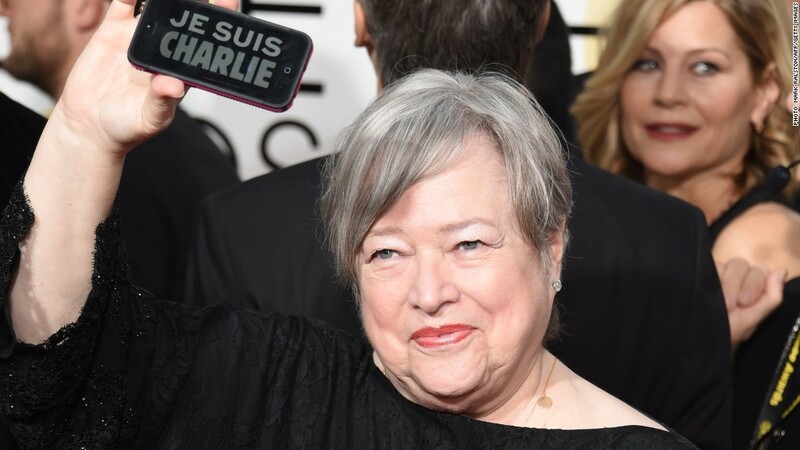 Actress Kathy Bates held up her iPhone screen, which read "Je Suis Charlie." Mirren, interviewed on NBC about her pen pin, said it was a show of support in the wake of the attack at the Charlie Hebdo magazine office in Paris. At subsequent gatherings of mourners, pens have become symbols of free speech. "It's a great idea for all of us to stand by the ideal of free speech," Mirren said. "It's very difficult to maintain that ideal, but it's a good one to aim towards." During the awards show, Leto said, "our thoughts, our prayers, our hearts" are with the people of France. Actress Kathy Bates held up her iPhone, which read "Je Suis Charlie," in a show of support after recent attacks in Paris. The Golden Globe awards are bestowed each year by the Hollywood Foreign Press Association. The association's president, Theo Kingma, spoke tonight about the "importance of freedom of artistic expression, as not only an integral part of the American fabric, but a beacon that is reflected across the globe." "Together," he said, "we will stand united against anyone who would repress free speech, anywhere, from North Korea to Paris." The reference to North Korea -- and what the United States believes was a North Korean cyber-attack directed at Sony Pictures in retaliation for the movie "The Interview" -- was pointed, too, and the attempted censorship of the movie came up repeatedly on Sunday night.